Marcrista Luxury Charters operate in an area which is listed as one of the Natural Wonders of the World - the beautiful expanses of the Great Barrier Reef. We offer personalized itineraries which offer our guests the opportunity to sample some of the pristine areas and concentrate their time in activities and areas of their choice. 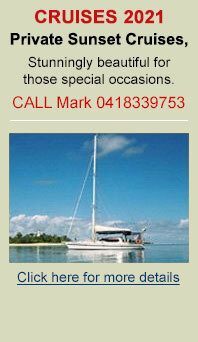 We can offer island hopping or longer sailing passages. 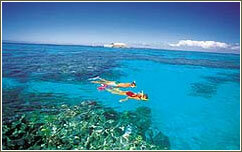 A sampling of land content can be offered taking in rainforest areas or nature walks on secluded islands. For those wishing to experience more fully some of the exclusive resorts we can offers a Sail/Stay package with return commuting by air for variety and time expediency. Diving, snorkeling and fishing are popular activities in these areas and we can satisfy your requirements so far as excellent locations and equipment is concerned. If you would like to combine your leisure time with the desire to pursue a particular interest whilst on board, whether it be Sail Training, Marine Biology, Meditation etc. we will do our best to satisfy your needs. For those whose love is sailing we are happy to share the helm and our nautical knowledge! Honeymoons or weddings on board are one of our special joys - a privilege to share in such wonderful times. Marcrista makes a beautiful floating chapel with some magnificent photos circulating around the world to prove it! We welcome families on board - preferably with children over the age of ten. We delight in their company and enthuse about the benefits of quality family time spent in such an environment, with the opportunity for so many shared adventures.